With the SR6013 AV Receiver, surround yourself in 3D surround sound and immerse yourself. Featuring the Dolby Atmos and DTS:X surround. These have the ability to use overhead speakres and is equipped with 9 channel amplification. It uses up to 183 watts per channel, so you can set it up as a 7.1.2 or a 5.1.4 for a ultimate 3D experience with using a external amplifier. With an additional amp set up, it can expand to a 7.1.4. The SR6013 features 11.2 channel processing, and is simpler for surround set-ups for two channels that are integrated and assigned to drive speakers for a second audio zone. You can even setup a different source then the main room. With the SR6013’s advanced video section, it is fully compatible with the latest HDMI and HDCP 2.2 specifications. With up to 8 different HDMI inputs and the implementation of 4K Ultra HD 60Hz video, Pure colour sub-sampling of 4:4:4, a High Dynamic Range, and HLG, 21.9 Video, 3D and BT.2020 and Dolby Vision pass-through on every input. The Enhanced Audio Return Channel for full resolution via ARC is supported. With a Built-in HEOS wireless music network technology, it means that the SR6013 can integrate with other HEOS Products, to allow your favourite music to be around your home. Explore your music library and access online streaming music services, thousands of internet radio stations used with the free HEOS app. With the use of Bluetotth and Airplay 2 they let you stream music directly from any compatible device. 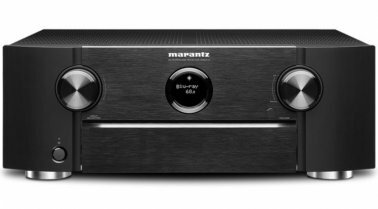 9.2 channel AV Receiver to fill big rooms with Marantz sound. Eight HDMI inputs with full HDCP 2.2 Support, uses three HDMI outputs and extended connectivity ready for projector in parallel and display in a second room. With up to 9 channels for sound for music and movies, the SR6013 uses high current output amplifier devices, the drive capability for speaker control, it is compatible with 4 ohm speakers using up to 185 watts per channel. The Eco mode provides energy savings, it features a Eco meter, which allows the receiver to be used in power saving mode, it will reduce the maximum output power without affecting the sound quality. A single subwoofer demands optimal placement. The SR6013 supports two subwoofers: used in different.